Oded Balilty, who works for the AP, won the 2007 Pulitzer Prize for breaking news photography. 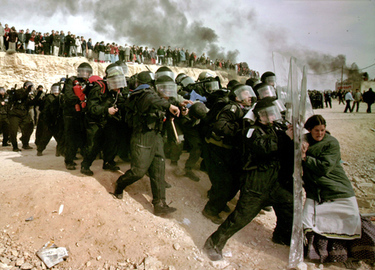 The winning photo was an image of one Israeli woman "defying Israeli security forces in the West Bank". I don't wish to make any political statements or asses the morality or what have you of the situation, but simply to share this photograph, which is just amazing. Read more about Oded Bality on the AP website.